Now, the big bike. Here is a somewhat blurry picture. 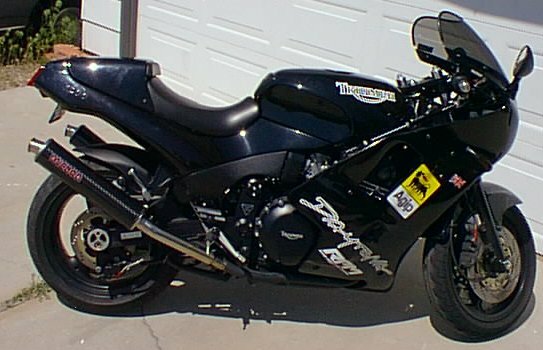 A 1995 Triumph Daytona 1200. Purchased in November 1996 as a leftover, then left in a garage in NY for 4 months until the snow went away. I've got almost 13000 miles on it. Very very fast. I've done a couple of modifications. One is an RPM ignition advancer, set at 6 degrees. Seems to pick up the response a little and gain some power lost to altitude, by my seat'o the pants dyno. Also installed are a pair full floating front brake rotors off of a 1996 model Daytona for increased control and feel. The Micron carbon fibre slip ons weigh less than half of one stock muffler! With that, a Dynojet carb tune kit was also added. I have also geared to down to 18/44 - lost some top end but now does great wheelies. Mods all together make the bike run much better and (with the loss of weight) handle better, too. According to my sources, only 55 were imported to the US in 1995, making it extremely rare. Right now I've dumped the stock bridgestone tires (which sucked) and am running Dunlops D207 ZR's. These tires are fantastic cheap (relatively) tires. They stick and slide remarkedly well. 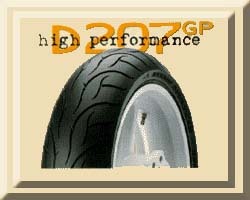 The GP's are ultimately better - Stick stick stick, but make a crummy street tire - they wear out too damn fast. I would suggest using the "ZR" version for street. If you hammer corners constantly (and I mean Constantly) the GP's are the tires for you (I have them on my Ducati (when it isn't running slicks) - page coming soon).